Many countries have started producing geothermal electricity, as geothermal energy is considered a renewable resource, unlike the other fossil fuels that are slowly depleting. Presently, twenty-four countries use geothermal electricity. 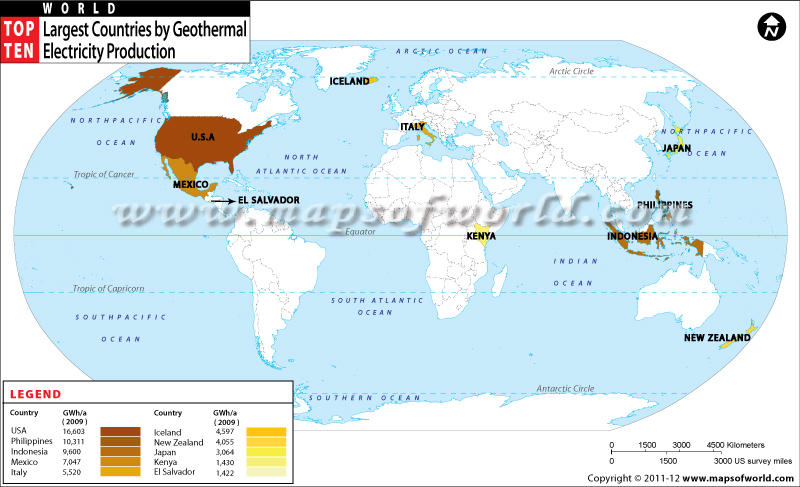 The world map with top ten largest countries by geothermal electricity production shows a list of top ten countries that produce maximum geothermal electricity. As shown in the map, the United States leads the world in the production of geothermal electricity; in 2010, the US generated 3086 mega watts of geothermal electricity. Philippines ranks second followed by Indonesia, Italy, Iceland and New Zealand. The rapid growth and success of geothermal electricity has led many other nations, particularly France and Germany to establish enhanced geothermal systems.